Tamnagorn is a fairly remote circle between Torphins and Ordhead, two miles north of the Learney crossroads, near the B993. If walking, explore the wee back roads and pretty, rather highland scenery of the little rolling hills and pastures of Midmar. There are buses between Aberdeen/Torphins or Aberdeen/Millbank. Ask permission at Tomnagorn farm to go up to the stone circle, which is visible at the edge of the woods overlooking the farm and reached by a track behind, about 300m up between the fields. The firs unfortunately obscure the view over the recumbent stone to the south-south-west. So it's best to see the circle in the evening when the sun if out, should light it up from the west. The lichen-covered recumbent stone and 6 of the 11 stones are still standing. 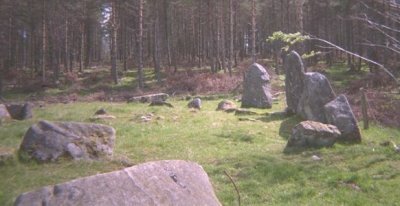 Within the circle is a ringcairn with visible external and internal kerbs. The outer kerb is linked by slabs to the recumbent stone and flankers.